This was the YAC (Young Adventurers Club) kickoff adventure! 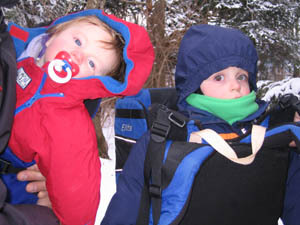 An unusual crew of two babies, four parents and one grandparent (not all related) made their way up the snow covered slopes of Paine Mountain in Northfield. 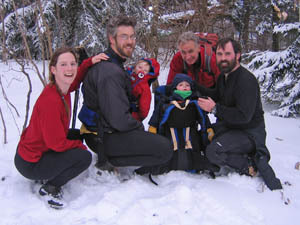 At the summit, we slurped cocoa, (all except the four month old, who slurped something more to her liking!) By the time we reached our cars at the end of the hike, both young people were sound asleep, and the trip was declared a rousing success!